PLEASE READ THIS ENTIRE THREAD TO INSURE THAT THE MODEL WILL FUNCTION PROPERLY IN YOUR GAME!!! Tested: I have tested these lots numerous times. 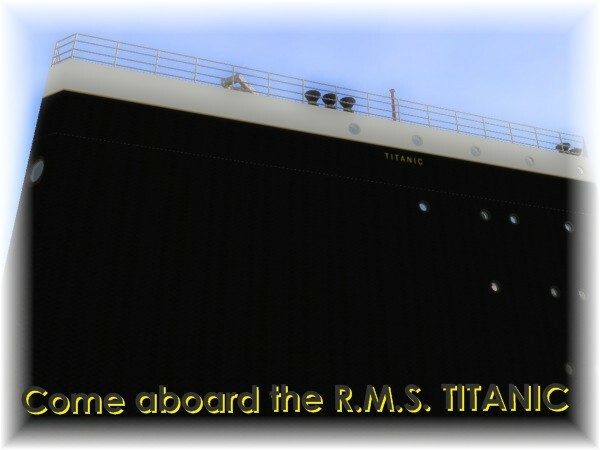 I am in the process of recreating the Film �TITANIC�, so I have also been video recording in these lots. Please note, I have a very slow and outdated computer, and these lots have been running very smoothly, and loading time is not bad. Miscellaneous: These lots have been tested with CLEAN INSTALLER. They are indeed safe and not full of junk files. Be aware that numerous pieces of Custom Content were used throughout the lot. All artists have been credited. Okay, now for the actual reading! 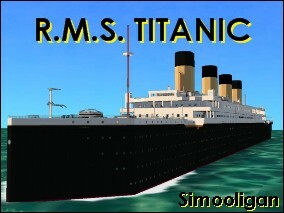 I am so excited to present to you, the long awaited SIMS 2 TITANIC MODEL! Started on Janurary 30, 2008, this project has been the largest project I have ever worked on, and I am so honored to be able to share it with you all. 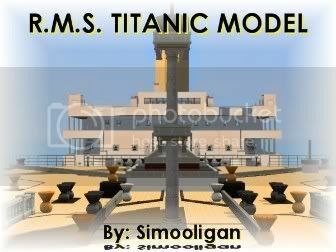 Titanic is one of my main interests or hobbies, or whatever you want to call it. 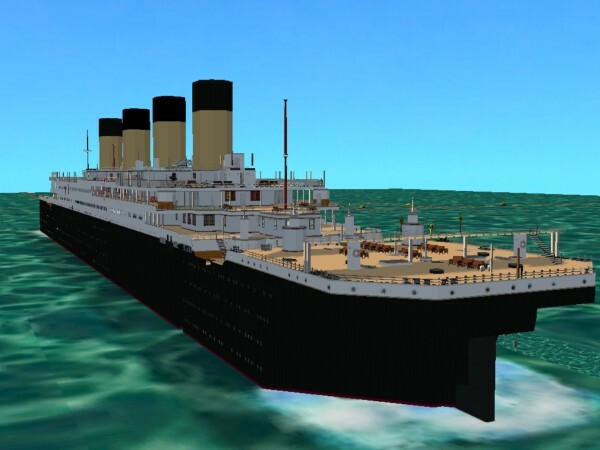 I have been studying the ship for 10 years, and I am so happy I was able to create the ship as accurately as possible using the Sims2! Without further ado, let�s get started! This model was created using actual blueprints of the ship. I have included as many possible details as I could. All furniture that you see on board has been placed according to how they were in photographs and the ship plans. Khakidoo, who is an artist here, made me three beautiful windows for the ship! Also, this project would not have been possible if it wasn�t for the talented Custom Content Artists here in the community. Yeah, I built a ship- big deal. It�s your content that makes the ship come to life. This ship is split into FIVE SECTIONS, or lots, starting with the �Bow�, then �Forward�, �Middle�, �Aft�, and finally �Stern�. 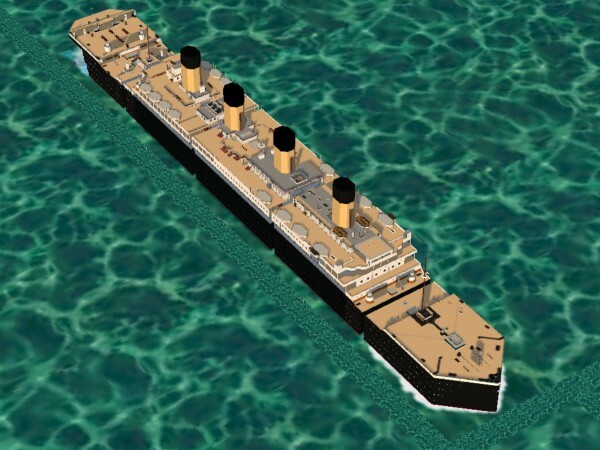 In your neighborhood, place these lots side by side to create the entire length of the ship. If you have Nightlife or any recent EP�s, you will be able to see each section/lot while actually entered in one of the sections. This ship was created with movie makers in mind, so as a movie maker, I think you will find this model to be very easy to use when filming. For this ship to function properly, it is suggested that you have all expansion and stuff packs up to and including TEEN STYLE STUFF. This does NOT require FreeTime, or any EP�s after FreeTime. There is no way for your sims to enter the ship. They must manually be placed there by using �moveobjects on�. Also, the ship does not REALLY move� so... lol. Download the �UNLEVELED WALL�. Please follow the instructions in Numenors thread so the wall repository can be installed without error. You will need to download his SCRIPTORIUM. - Khakidoo: Thanks for fulfilling my request for the windows. They are amazing!! - Angelsways1: Susan, thanks for creating some awesome stuff for my movie! - Zeroth: Quadratic Window! Thanks! - Macrossi: For your amazing Plants! - Mia86: No Chimney Fireplace! - Numenor: For your flag pole and Custom Wall Repository! - http://www.pimp-my-sims.com/ Thank you �FUNNY� �CHRISSIE� and �SOLANGERCGN�! Your amazing CC has been so useful in the creation of this lot. THANKS! - http://www.sterlingsims2.com/phpBB2/index.php Sterling Sims 2 Creators, specifically Tazz5840! - http://www.4eversimfantasy.net/ Thank you for allowing me to use your Dining Column and plants!! - http://www.pixelsims.com/ Thank you Helena for the small black window! - http://www.parsimonious.org/ Thank you Kate for your plants! - http://www.meshkiste.de/ Thank you the Phelana for the Rotwein Set! To any other artists I have left out, thank you, SO much, for this lot would not be complete without your work and talents! Please note, that the list of CUSTOM CONTENT BELOW may seem long, but reminder; this is 5 lots worth, so some material is repeating.